This article appeared in the November issue of VICE magazine. Click HERE to subscribe. Marino* drives a blue and white taxi through the streets of Acapulco, which means he has become hardened to horror. He’s used to paying weekly protection fees to local drug cartels and seeing co-workers killed even after they’ve paid. While I sat in his cab, he listed shops in the area where the owners had been murdered. He estimates 20 of his friends have died violently in the past 10 years. But even he winces when a client asks to go to the Progreso neighborhood and down Avenida Solidaridad (Solidarity Avenue). Gangsters kidnapped his 17-year-old son there, along with a friend, in March 2011. They didn’t ask for ransom, and the boy’s body was never found. Marino holds on to the slim hope that his son is still alive, forced to fight for one of the county’s cartels in Mexico’s ongoing drug war. This December marks ten years since Mexico’s government declared war on the country’s drug cartels. Since then, more than 150,000 people have been killed, and roughly 28,000 people disappeared, many of them victims of drug-war-related violence. In comparison, nearly 125,000 civilians died in Iraq between January 2003 and December 2012, according to the well-reputed Iraq Body Count project. Despite ten years of trying, the Mexican government has made little headway curbing gang violence in Acapulco. The drug cartels leave behind narcomantas—messages meant to inspire fear—around Acapulco. The death toll is emblematic of the failure of the government’s two-pronged strategy: taking down top cartel bosses, while simultaneously deploying federal-security forces to cities or regions where the violence has gotten out of hand. Over the past decade, the authorities have celebrated arrests or deaths of many cartel bosses with direct links to groups present in Acapulco, and the city, which is the main source of income for the whole state of Guerrero, has a very strong police presence. And yet, this year, Acapulco leads the country in homicides. The beach town wasn’t always this dangerous, and in an effort to turn the tide, many locals there continue to insist it’s not so bad. Just a few decades ago, Acapulco was a destination for the stars of Hollywood’s golden era. John Wayne and Frank Sinatra lazed on the beach; on their honeymoon, John and Jackie Kennedy caught a large fish they would later mount in the White House; Sylvester Stallone filmed parts of Rambo II in the bay. In the late 80s, the stars were replaced by spring breakers from the US, who danced to the popular Four Tops song “Loco in Acapulco” right up to the end of the century. By then, Acapulco had also become an important prize for warring cartels that wanted its port to traffic contraband through, and to access the city’s lucrative internal drug market, as well as the lush poppy fields located in the nearby sierra. Three months after the shootout, the severed heads of two police officers were stuck on poles in front of a government office near the same crossroads. One of the beheaded cops had participated in the gunfight. A message, lettered on orange cardboard, beside them said: so that they learn respect. Soon thereafter, a head washed up on a major beach in the middle of the day, another was placed in front of city hall, and just days before the July 2006 presidential election, another couple were left in La Garita with a familiar refrain—one more time scumbags, so that they learn respect. Decapitations have become common across Mexico’s drug-war hotspots, but back then, six severed heads in three months shocked the nation and made international headlines right before the election. Celebrities once flocked to Acapulco, but today the city’s tourism industry is struggling because of the severe violence. When Felipe Calderón was declared president on September 5, 2006, after his win by a narrow margin instigated a months-long post-electoral process, he kicked off his term with a military crackdown, deploying around 7,000 troops to his home state of Michoácan—where five severed heads were rolled onto a dance floor that same month. The second major operation took place in Guerrero, where Calderón sent 7,600 troops. Operations like this have come and gone around the country without a lasting impact on the violence. (Mexico’s current president, Enrique Peña Nieto, has essentially continued Calderón’s policy.) The government’s so-called Kingpin strategy of weakening the cartels by taking down their leaders, however, has had a lasting effect: It’s set off a cascade of new conflicts across the region. 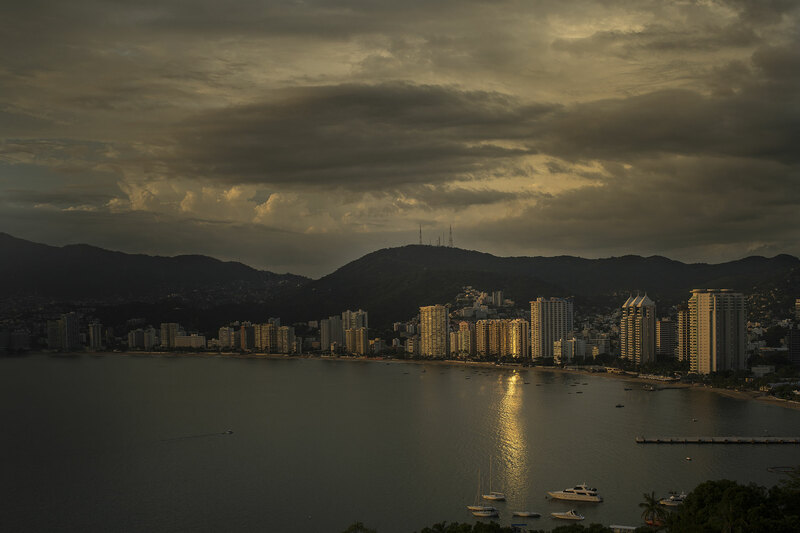 Acapulco’s downward spiral is associated with a shake-up of the Beltrán Leyva cartel. The cartel, formed by Arturo Beltrán Leyva and his three brothers, Héctor, Carlos, and Alfredo, had long maintained Acapulco as one of its bastions. In the early 2000s, violence caused by the Beltrán Leyvas’ defense of the city against the rival Zetas cartel propelled a spate of government crackdowns. However, tension bubbled up again in 2008, when the long alliance the Beltrán Leyvas had maintained with a distant relative named Joaquín “El Chapo” Guzmán broke down and all-out war exploded between the former allies. The gang violence in Acapulco escalated further when the Beltrán Leyva cartel’s leader, Arturo, died in a Scarface-style shootout with Mexican authorities in 2009. Arturo’s death triggered a series of splits in the Beltrán Leyva organization, and Acapulco became a narco war zone. Vicious battles reached a peak in 2011 as pieces of the Beltrán Leyva cartel splintered into a number of new factions. This plethora of new gangs, like the Independent Cartel of Acapulco, the Barredora (mechanical street sweeper), and the Devil’s Commando, battled one another, while rival criminal organizations tried to move in. 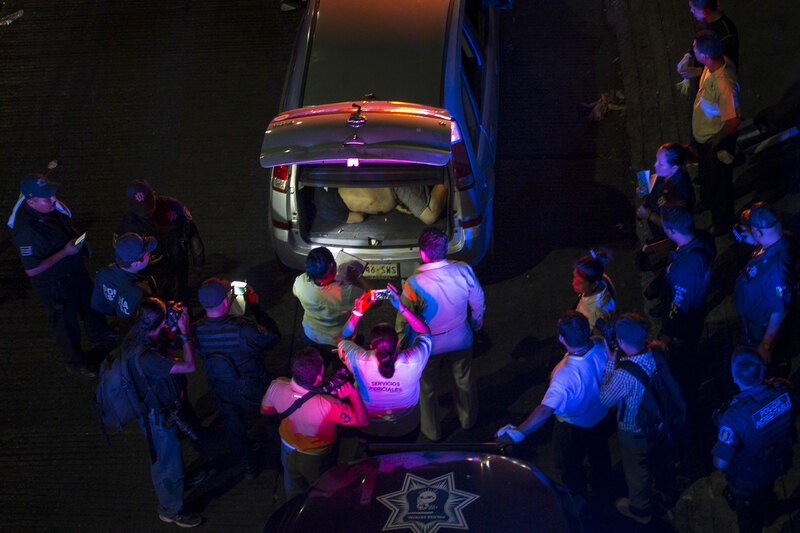 Dr. Keynes García worked at Acapulco’s morgue at the height of the violence in 2011. He recalled the time 14 torsos were found in one part of the city, and a similar number of heads in another. When confined to outlying neighborhoods, authorities seemed to ignore the bloodbath, but a string of violent events in the heart of the tourist areas triggered a major security initiative called Operation Safe Guerrero in 2011. Of the thousands of soldiers sent to the state, more than 3,000 were stationed in Acapulco. 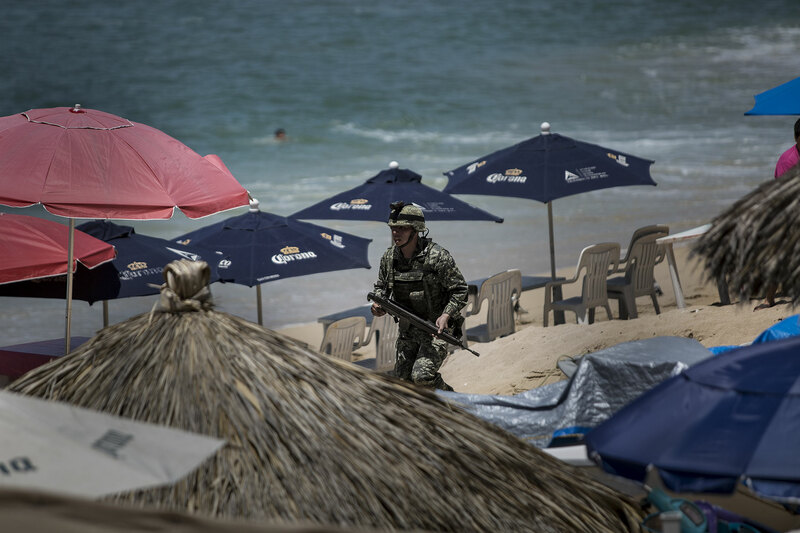 As with most other deployments, the operation did initially dampen the violence in Acapulco, but the battle for the city continued and homicides rose once again. President Peña Nieto did little to change the strategy that Calderón had put in place when he took office in December 2012, but he did promise better coordination between law enforcement agencies. This, he claims, was the main reason the murder rate dropped somewhat between 2012 and 2014. He has also recently celebrated the successes his government has seen in taking out kingpins, particularly the capture, in January 2016, of El Chapo, who had been on the lam for six months after his embarrassing escape from a maximum-security penitentiary the previous summer. Peña Nieto gave a press conference following the arrest, flanked by members of his cabinet in Mexico’s national palace. 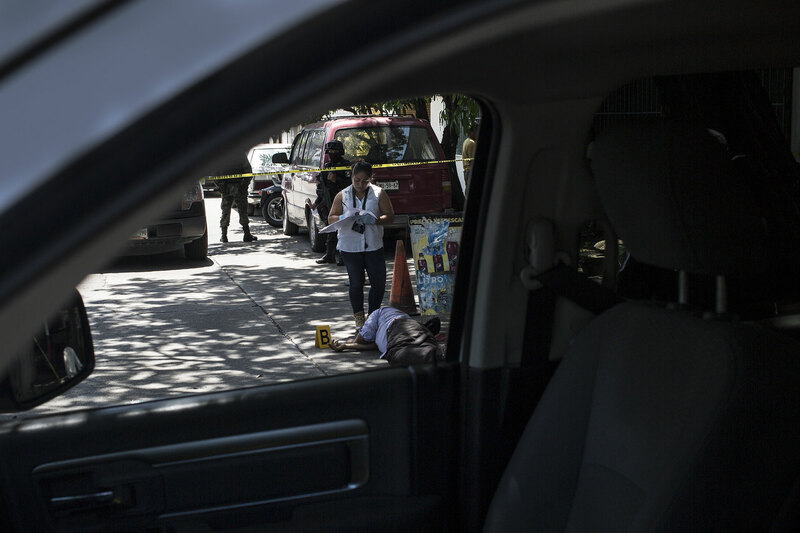 It was, and remains, a far cry from the reality in Acapulco, which is one of the cities seeing a renewed rise in its murder rate. The resort city accounted for nearly 5 percent of all homicides in Mexico between January and July of this year. But there are still many citizens in the city, particularly in the tourism industry, who insist things really aren’t that bad. “The past is the past, and the present is a gift,” said Erick de Santiago, the owner of a beach bar and a member of the business group Speak Well of Acapulco, when we met this past September. “So we have to work for a better future.” He stressed repeatedly that the violence hardly ever affects tourists along the main strip, known as La Costera (the coast), and insisted on listing the city’s attractions from its famed cliff divers to its laid-back vibe. “We’re trying to promote positive news about Acapulco,” he said. But hours after we spoke, shots rang out a few blocks from the central bus station. The killers left two men slain on the pavement floor of a small outdoor restaurant. After forensics workers removed the bodies, the family who owned the shop cleaned up the blood, hosing pieces of brain down a nearby drain. Earlier in that week, the government announced yet another new security initiative aimed at the 50 municipalities with the highest homicide rates. Acapulco saw hundreds more federal and state security officers arrive on September 3. “Other strategies, like Safe Mexico, Safe Guerrero, it’s evident that these strategies didn’t stop the problem at the root,” said Guerrero’s state-government-security representative, Roberto Álvarez, referring to the 2011 special operation. “The problems continued.” But Álvarez claimed that the new operation would be different because it would “tackle violence through the use of intelligence, technology, and operation coordination between the federal, state, and municipal institution.” Acapulco’s police chief, Max Sedano, also insisted that this time the various law enforcement agencies would be focusing on coordinating better, right from the start. “Before we were close, now we are together,” said Sedano confidently, sitting behind his desk at the police station. “My hope is that we’ll bring back the Acapulco of 30 years ago.” He explained the new initiative would not only protect beachfront areas, but also pinpoint strategic targets throughout the city and go after the criminals in their bastions. He pulled recent statistics from his desk that showed that murders had decreased in the first six days of the new operation. A few days later, news spread through Acapulco that police in northern Mexico had arrested Clara Elena Laborín Archuleta—the wife of Héctor Beltrán Leyva, the final remaining brother (Alfredo and Carlos were arrested in 2008 and 2009, respectively), who was captured in 2014. 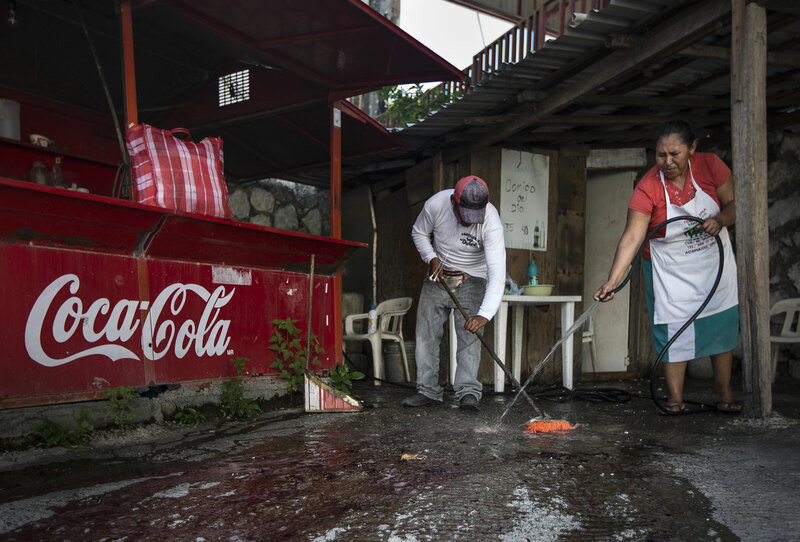 Narcomanta—the messages left behind by drug cartels—had, for months, claimed that much of this year’s violence in Acapulco was related to Laborín Archuleta’s attempt to reorganize the Beltrán Leyva cartel and retake the town. Businesses in the beach town, like this small outdoor cafe, struggle to stay open amid the violence. Hours after the arrest, two severed hands staged as a to-go plate of tacos—wrapped in tortillas, fully dressed with cilantro and red onions—were left on an Acapulco street. The following week, authorities discovered Guerrero State police director, Tomás Hernández, stabbed to death in his home in the Progreso neighborhood of Acapulco, the same neighborhood where the taxi driver Marino’s son disappeared. Caballero is a member of an organization of shop owners in Acapulco and claims that since 2010 membership has dropped from 400 to 200 because so many shops have closed down due to the lack of tourists. “People stop coming, there’s less employment, more crime. Then bam, bam, bam, it continues,” Sedano said. “We need to improve education and increase employment. The majority of the criminals are between 15 and 20 years old.” Many of the victims are just as young. Maria Elena works at a restaurant near her home in the Progreso neighborhood. Her eyes welled up with tears when she talked about her 18-year-old son, who disappeared in 2008. She described the daily fear she overcomes just to go to work. A yearning nostalgia infused her tone when she recalled her childhood at a time when the city was still filled with movie stars. The following afternoon, two men were gunned down one block from Elena’s home. Police blocked off the crime scene while tortillas still cooked nearby.